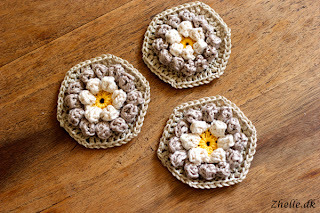 I've been fascinated by a crochet project almost ever since I started crocheting (which is not that long ago), and I've finally started it! So far I have made 3 cute, small hexagons. The project itself can be found at the wonderful blog Colour in a simple life (the direct link to the project here ). 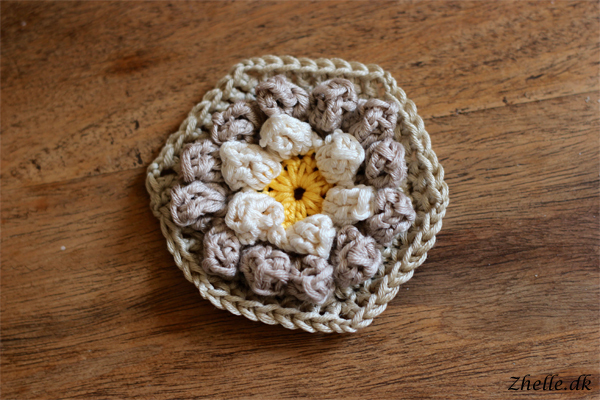 She calls it the Almond Blossom Bag, which I find is a brilliant name for this project. The bag is being made up of 13 flower hexagons sewn together. I absolutely love the colours Karen used on her bag, so I have sort of copied them onto mine. Only sort of, because I couldn't find the exact colours, where I bought my yarn. The yarn I am using for the project is Essentials Cotton dk from Rico Designs, and it is a nice mercerised cotton. 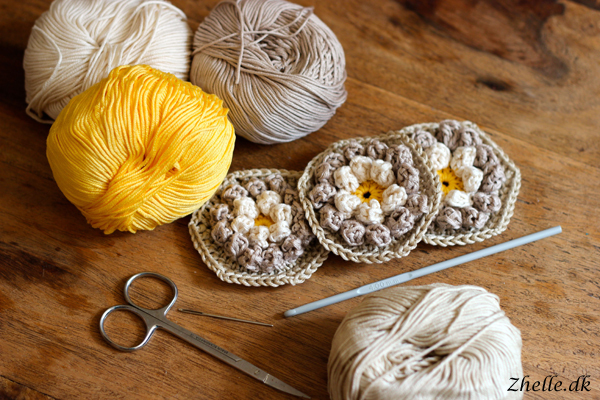 I use a 4 mm hook for the project, which means the flowers are about 8 centimeters in diameter. I might make another bag at some point where I will use some other yarn and a bigger hook, so I can get a bigger bag. The center: Colour 63, a beautiful yellow colour. 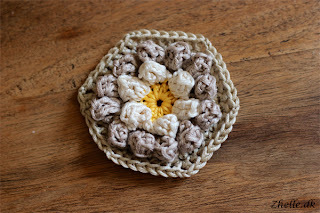 The inner petals: Colour 51, a light cream colour. The outer petals: Colour 91, a darker creamish brown colour. The actual hexagon: Colour 50, which has a bit more yellowish hue than colour 91. I bought the yarn at The Wool Shop. I really like the result so far, and I am so grateful to Karen for putting up the pattern and very good tutorial on how this is done!